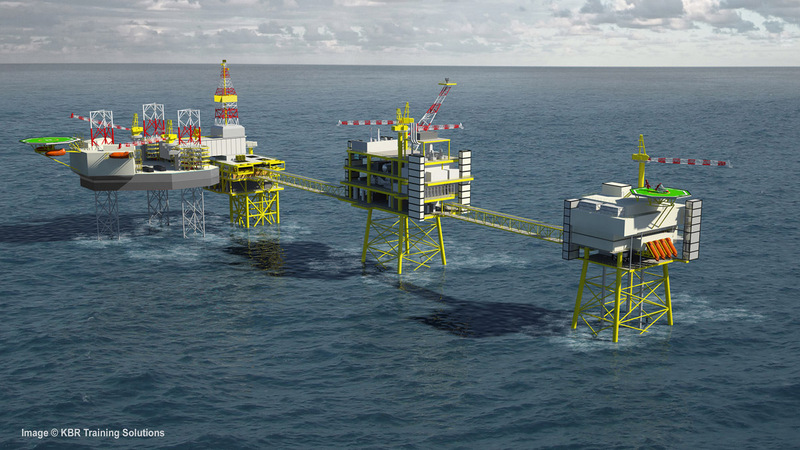 The Maersk Oil UK operated Culzean project, one of the largest gas discoveries of recent years in Scottish waters. Total investment is expected to be in excess of £3bn (US$ 4,7bn). Debt and Destiny is the title of a new report produced by the pro-union Scotland Institute and it contains an explicit admission that the Scottish economy is much stronger than the residual UK would be. Scotland can afford to take more than a population share of UK debt after a yes vote because we can afford to, according to one proposition for allocating debt. In others words we are a rich country as Yes Scotland, the Scottish Government and Business for Scotland have convincingly argued. So it is official – Scotland is richer than the UK, and the unionists agree. 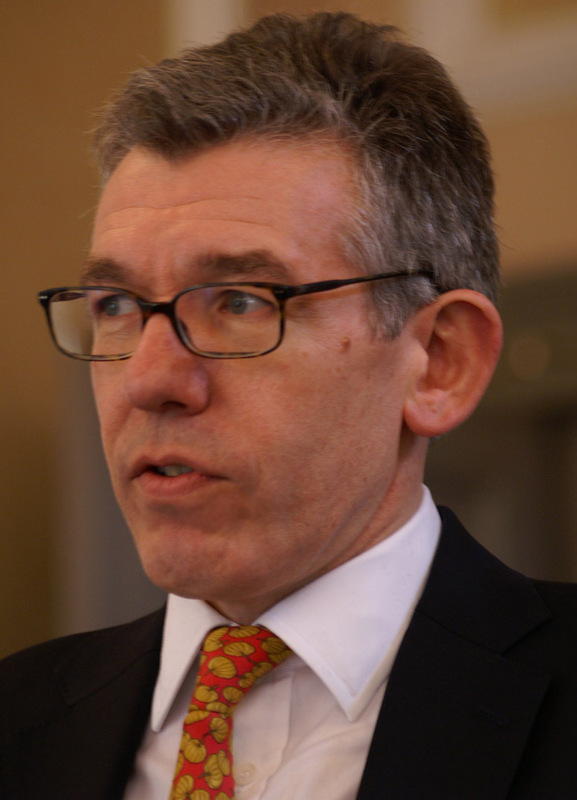 Debt and Destiny by Jonathan Price, a Legal Fellow at think tank The Scotland Institute, set up last year by Dr Azeem Ibrahim, does however provide some useful commentary on the issues surrounding how debt might be split following a Yes vote. The section on debt allocation between the Czech Republic and Slovakia is worth reading. Debt and Destiny includes a table of possible outcomes of how debt would be split based on work done last October by Angus Armstrong and Monique Ebell of the National Institute of Economic and Social Research (NIESR). So lets have a wee look at this amazing table which is accurately reproduced below with the addition of some colour to make it easier to read and the important words ‘Affordability Basis’ which both NIESR and the pro-union Scotland Institute have not shown the basis on which the data was calculated. The most commonly quoted calculations of national debt are PSND (Public Sector Net Debt) as a percentage of GDP. See yellow highlighted lines. Various figures are quoted for debt as a percentage of GDP, varying according to the date for which they are calculated. The NIESR figures quoted by Debt and Destiny are a projection for 2016/17 based on Office of Budget Responsibility (OBR) projections. At present PSND is calculated at 1.3 trillion. NIESR used an OBR projection of 1.58 trillion for 2016/17, usually rounded at 1.6 trillion. Given that the annual deficit is still rising month on month, and this is an old calculation, £1.6 trillion is unlikely to be an underestimate of PSND by 2016/17. The really interesting revelation is the analysis of where the wealth is created. With debt divided on a per capita basis, Scotland’s share would equal 74% of GDP by 2016/17 against 89% of GDP for rUK. This we know, but it is not as promoted by Better Together. Now the second yellow highlighted line headed Debt divided by GDP (geographical oil basis) would lead the observer to think that Scotland’s share of the debt on this basis is the one that includes a geographic share of oil revenues. But it makes little sense that Scotland’s share of the debt is actually higher at 87% on this measure. In fact all figures in the column headed ‘population basis’ are a population share of oil revenues and all figures in the last column include a 90% geographical share of oil and gas revenues. This creative ‘affordability’ calculation by Angus Armstrong and Monique Ebell of NIESR, and reproduced by Jonathan Portes in his Debt and Destiny paper, is an acknowledgement of the wealth created in the Scottish economy which has the highest GDP per capita of any of the nations and regions of the present UK after London. 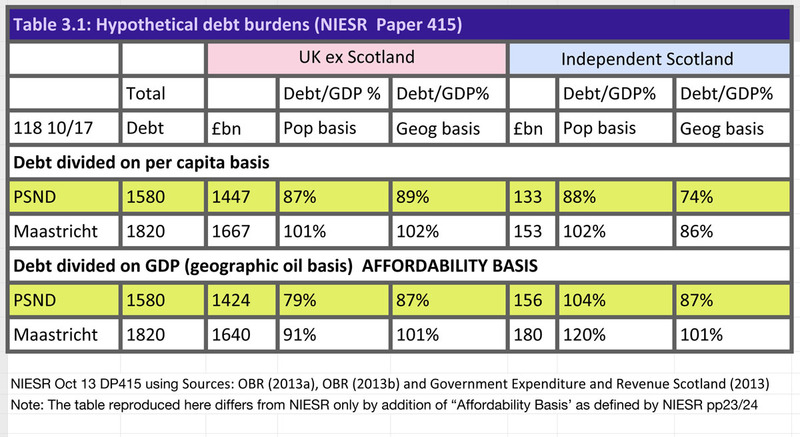 NIESR use an ‘affordability’ test for splitting the debt because of the strength of the Scottish economy. We are a richer country per capita than rUK so we can afford to take more of the debt. Better Together like to emphasise sharing. Now we know why. The NIESR calculations on the affordability argument undermine everything that the unionist side promotes that suggests Scotland would not be economically viable. Because we are doing so well, NIESR argues we can take a higher share of the debt. Economists can argue from any point of view, but this is an acknowledgement we are bailing out the UK and have been for years. As a net contributor we pay more than our way and take out (are given back) less than we contribute. Only access to all our revenues and control of all expenditure will enable the real wealth of Scotland to work fairly for all of our people. The lines below the yellow ones are Maastricht calculations of debt. This is Gross National Debt as defined by Maastricht and will be the figures used in independence negotiations. Maastricht does not exclude the debt of public bodies nor include government liquid assets. The UK Government tends to avoid referring to the substantially higher figures for gross national debt and quotes data based on net debt. However it is Maastricht national debt figures that are reported to the EU and used by economists and credit agencies, but which obtain little, if any, coverage in our national media. The gross debt figures do not include the IOU’s written for future generations, such as any underfunding in public service pensions and future commitments on the state pension. Instead of putting our money aside for the future, the contributions we have paid towards our state pension have been spent, like the oil revenues. Just hand the liability down to the next generation. Hardly an exercise in sustainable economic management. Future liabilities will be another item on the negotiation table, but the UK government has guaranteed that pensions payments will be honoured. 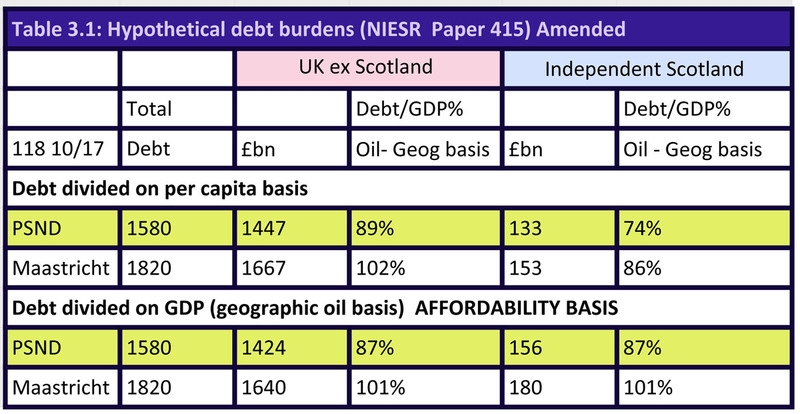 When debt is split on Maastricht reporting criteria Scotland’s debt rises from 74% to 86% of GDP and rUK’s debt rises from 89% to 102% of GDP with oil revenues allocated on a geographic basis. On the ‘affordability’ test on the Maastricht criteria line, rUK as the poorer party, sees its debt fall from 102% to 101% whilst Scotland as the richer economy by GDP per capita would see its debt rise under Maastricht from 86% to 101%. All this demonstrates is that Scotland is better positioned to manage its residual debt than rUK and that long-running spurious claims for the oil resources to be split on a population basis (the oil is in Scottish territorial waters) are designed to muddy the waters and confuse. As we have been net contributors to the UK Treasury for 33 years this is tantamount to charging us twice. The Scottish Government and the Fiscal Commission have argued that, based on our historical contributions over the last 33 years, our net contributions should be recognised in the apportionment of the debt we should accept responsibility for. Armstrong questions whether it is reasonable to retrospectively allocate tax revenues from oil and gas and not allocate exposure to banks? As the Scottish Government is prepared to offer to take a fair share of the debt in return for a fair share of the assets, the negotiations would also deal with an apportionment of outstanding public investment in the banks along with a share of the remaining UK equity shareholding in the rescued banks. It is conveniently forgotten that the UK guarantees to the banks during the financial crisis were written on high-risk premiums and the Treasury actually made money on the deal. Secondly Angus Armstrong argues, “There is at least some evidence from economic historians that Scotland has been the main beneficiary of the Union.” There may have been some historical advantage in the years of Empire. From detailed accounts of contributions from the nations of the UK up until December 1921 when Ireland became independent, the evidence is Scotland was a net contributor to the ‘Imperial ‘project. Perhaps not surprisingly with the independence of Ireland in 1923 these accounts were quietly discontinued. For the intervening years from 1923 to 1979 there are no accounts detailing Scotland’s contribution. What we do know is that for the years the data was compiled Scotland has been a net contributor. The case therefore for the historic basis has evidential support. That final line of the NIESR table on debt is the Maastricht calculation based on the creatively engineered ‘affordability’ measure. This works out at 101% of GDP for both rUK and Scotland. These debts and assets have been created by successive UK governments and they accrue to the people of these islands. Each and every one of us. Only land mass and maritime waters and their resources are divided geographically. If there is any substance to the argument every person in Scotland should take a bigger share of the debt, then that would have to come with a correspondingly larger share of the assets. Continuing state or new state? There is of course the question of whether we take any debt if a share of the assets is taken off the table by the UK government in the negotiations. For its own reasons the UK is arguing it is the continuing state and Scotland would be a new state. This also has implications for debt liability. Only viable if a share of the assets passing to Scotland is also inflated correspondingly. Verdict: Proves the point that Scotland is better placed to manage debt reduction, but not going to happen. This is what the Scottish Government is proposing. What makes sterling what it is as an international traded currency (with the resources and assets that back sterling) has been a joint venture. Currency union and a fair share of the assets are the deal in return for a fair share of the debt. This implies both states have continuity status. Issues: London parties say no. The Scottish Government cannot back away from this position or it would be seen as unwilling to take a share of the debt. If London still refuses, other options open up for Scotland. Verdict: The sensible outcome with some fudging round the edges to enable Westminster to sell this to parliament and population of rUK. We take an historic share of the debt (estimated at 38% of GDP) on the grounds we have been a net contributor to the UK for the last 33 years. The debt the UK has accumulated is at high levels through persistent overspending. Verdict – better case than option 1 but we would at least have to accept some share of the current budget deficit in recent years as a result of the international financial crisis and historic UK debt accumulation. Verdict: Progress on this likely to be limited at best. Westminster sticks to it guns on continuity position and no currency union. Scotland has offered to take a share of the debt and walks away debt free with the option of using the pound anyway. Scotland 0%, rUK circa 114%. Verdict: unlikely, but Westminster has a sense of it’s residual former position on the world stage. The markets are unlikely to think this would be a good move and rUK would be punished in the yield demanded to take the risk of holding rUK debt (Gilts). With indications of a rise in bank rate coming before 2016 rUK would be doubly punished on the rate it would have to pay on its debt with bank rate going in the opposite direction to the present trend in the rest of Europe. Correlation of bank rate to yield on debt would result in another upward spike in the cost of rUK borrowing. 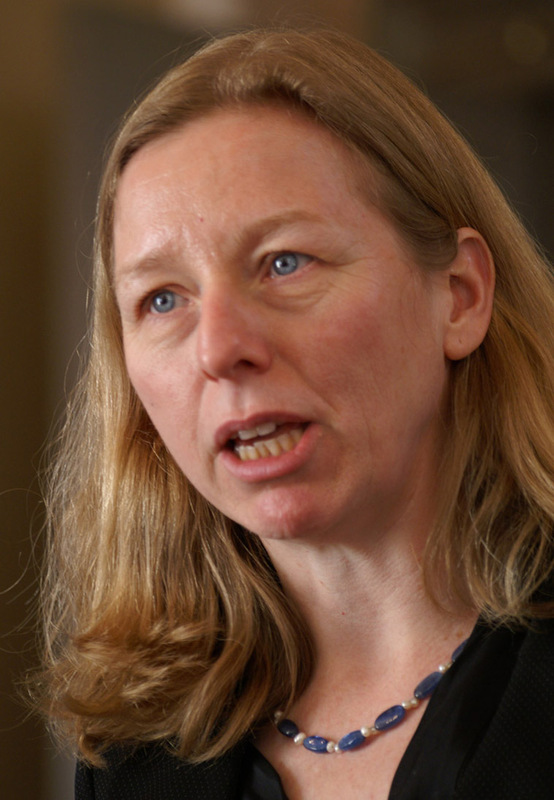 Readers will have noticed that the NIESR table reproduced first could be further simplified. By removing the columns that distribute oil on a population basis it is much less confusing. The Office of National Statistics has always insisted in including population and geographic allocations of North Sea oil and gas revenues in National Statistics publications. A population share would give London 91.6% of Scotland’s future oil revenues and Scotland 8.4% of the much smaller revenues from the southern sector of the North Sea. Scotland’s land boundaries and shoreline are clearly defined, as are our maritime boundaries with the exception of the line redrawn from Berwick in 1999. No serious academic would claim that a population share of resources contained within another country’s land, maritime borders and jurisdiction would ever come about. Academics are obliged to recognise this conflict when carrying out their research, but might do so by recognising the unworkability of such a solution ever emerging at the end of negotiations and exclude this option in the interests of clarity. That confusion is useful to Westminster and Scottish unionist interests should not be overlooked when people are seeking the best possible answers to their questions. There are four core interlinked issues Debt, Assets, Currency and Succession and it is not sensible to divide these into silos. The Scottish Government, unlike Westminster, operates with high-level key objectives that all departments have to work towards. The same must be the path for negotiations. Work out where the mutual advantage is greatest for both parties and then resolve the detail that fits the predetermined objectives. This entry was posted in Economics of Indepenedence, Economy, Politics and tagged currency union, Independence, Scotland, UK debt. Bookmark the permalink.